In the old days, people drank their morning coffee while reading the newspaper. These days, they're more likely to drink it while reading the Web. Indeed, most of us have a batch of favorite sites we like to hit every morning (with or without a hot beverage). For example, I routinely head to PC World (you just knew that was going to be first on my list, didn't you? ), followed by Gizmodo, TV Squad, Facebook, WeatherBug, and Lifehacker. 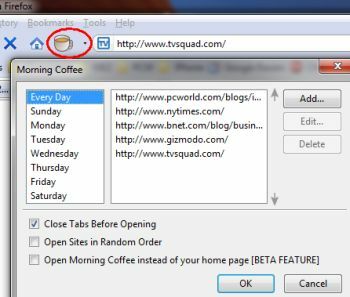 Firefox add-on Morning Coffee instantly loads those and other designated favorites into their own tabs, effectively splaying them out across my browser like the sections of a newspaper. After installing the add-on, you'll see a new coffee-cup icon just to the left of the Firefox address bar. Head to a site you want to designate as a favorite, click the little down arrow next to the coffee cup, and then mouse over Add to My Morning Coffee. In the subsequent menu you'll see choices like Every Day, individual days of the week, and Weekends. Morning Coffee has the enviable capability of letting you designate different favorites for different days of the week. For example, you might want to look at work- and business-related sites during the week and more leisure-oriented stuff on the weekend. You can manage your picks--remove entries, change the display order, etc.--by clicking that same down-arrow and then choosing Configure Morning Coffee. Savvy Firefox (and even IE) users will note that you can already configure the browser to automatically load multiple "home" pages on startup--but that's not quite the same thing. With Morning Coffee, loading your favorites is optional--and just a click away. I think after a few days of enjoying this convenience, you'll wonder how you got along without it. Morning Coffee just brewed its way onto my list of must-have Firefox add-ons.